Using pink, make one basic pony with a female nose and a horn. For detailed pictures of how to make the jacket, please refer to Cid’s pattern. The body of the jacket is made in two parts so that it’s more symmetrical. It’s certainly possible to do it all in one piece if you choose, just attempt to mirror the way the armhole is shaped. Personally, I think it’s easiest to just stitch it up the back. Rows 2-4 create the armholes for the jacket. With red, ch 14 (1 to turn). Finish. Leave a long tail for sewing up. Stitch the two halves together with the seam going up the back. The sleeves are crocheted directly into the armhole gaps in the jacket body. It doesn’t really matter where you begin picking up the stitches, just as long as you split up the half-double and single crochets so that the taller stitches are on what will be the outer part of the arm. I try to place the start of the spiral at the back so the colour change isn’t as noticeable. With the right side of the jacket body facing you and red, pick up and sc the 9 chain sts from row 4 of the jacket (insert your hook into the corner just before the first chain). Pick up 5 sts from the back side, sc the 7 "blank" sts from row 2, and pick up 5 sts from the front to finish the circle. Continue in a spiral (26 sts). The collar is also crocheted directly onto the jacket body. With the right side of the main jacket facing you and red, insert your hook in the rightmost peak of the neck edge (approximately row 6 where the dc 3 tog was). Pick up and sc approximately 25 sts evenly to the opposite peak. (How many sts you pick up depends on how tightly you crochet. It doesn’t really matter as long as it’s evenly distributed and you’ll get a smooth collar without any bunching or rippling.) Turn. Finish. You can sew down the edges of the collar to make them stay down a bit better with the tail ends of the yarn or leave it as is. Chain 26 and join in a circle. 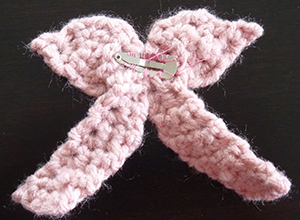 The ribbon is made in three parts: the bow and the two tails. Chain 2 (1 to turn). Chain 3 (1 to turn). Leave the end long enough to sew to the bow. Stitch the narrow end of each tail to the bow so that they are curving away from each other. I placed the tails slightly behind the bow. I sewed the finished ribbon to a tiny hair clip I had. 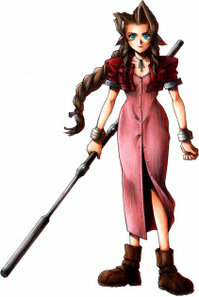 You could also stitch it directly to Aerith’s braid. 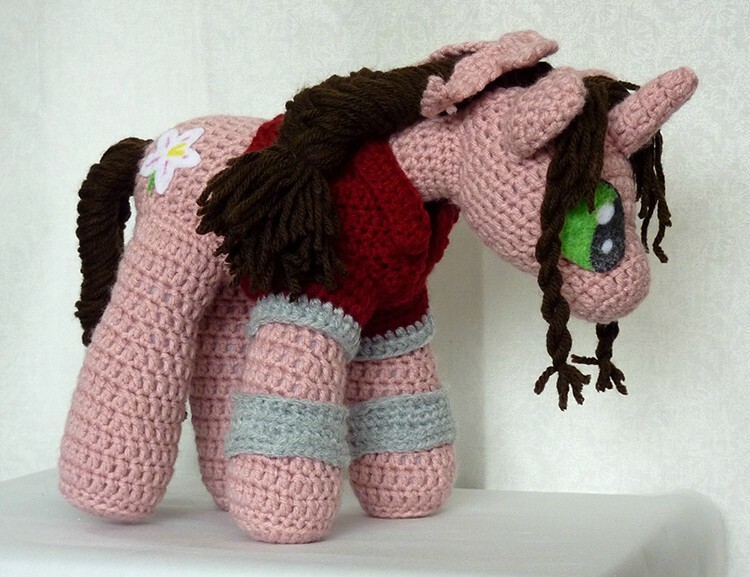 I made Aerith’s mane using brown yarn and EssHaych’s method as per usual. I used yarn strands quite a bit longer than I would normally for both the mane and tail. I did rows of three (so 6 strands total per row) and split them down the middle as I went. Then I did a fishtail braid. It was pretty narrow at the top and bulky at the bottom. In the future, I might use a piece of batting and pad out the top part of the braid. When I started coming to the ends of the top yarn, I tied it off using a matching strand of yarn. I did the little twoodly-doo bits (technical term) at the front of her head by attaching three pieces of yarn on each side of her head (6 strands total) and dividing them in half and twisting them together very tightly, then tying at the bottom. I added strands for her bangs wherever seemed logical, making the left side a bit longer and fuller than the right. You can also do what I did for Sephiroth’s bangs, which will look a little better. I made her tail as usual, but super long, then fishtail braided it as well.